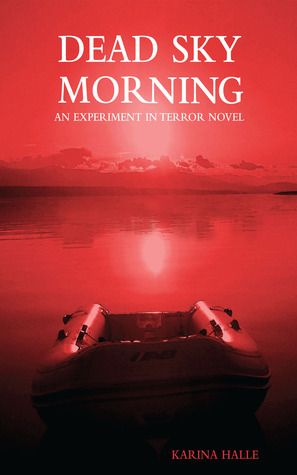 Dead Sky Morning is the third book in Karina Halle’s awesome “Experiment in Terror” series, and one that I’ve been anxiously waiting for since the conclusion of Red Fox. Once again, lead characters Dex and Perry are thrust into a spooky atmosphere and harms way for the sake of their internet show about ghost hunting. This time, Halle really pulled out all the stops in the spookiness department by chucking the duo on a remote island all by themselves. Well, unless you count the murderous entities, the psychotic racoons, and the creepiest herd of deer on the planet. Dex and Perry head to a tiny Canadian island that once housed a group of cast-off lepers and now acts as a campground, although most people have enough common sense to stay away from it. But common sense and ghost hunting rarely go hand in hand (I mean that in the most loving way, as my aunt is ghost hunter), so Dex decides its story would make for great television and off they go. The first third of Dead Sky Morning focuses more on what happens before they reach the island. Perry is in deep trouble with her parents, and Dex is going through a rough patch with his perky Wine Babes girlfriend. Halle takes her time getting to the meat of the book, and for once that is perfectly acceptable. If anyone else did that, I’d say they took too long to get to the plot, but with Dex and Perry, you just want to spend every moment following them around and watching them interact. They could be sitting in a library reading Hemingway for the entire book and it would still be enthralling. They could talk about hangnails for 45 pages and I would say “tell me all about it!” There is just something about the two of them that makes ever scene super-charged and intense. Once they reach the island, things get totally crazy. Between Perry’s strange visions, Dex’s issues, the constant battering rain, the encapsulating fog, and the fact that the entire freaking campground lies directly above a bunch of dead people, the island is just not a happy place. Halle does a great job of creating an eerie atmosphere, always going more for a sustained sense of foreboding rather than the immediate payoff of a shocking, messy scene. Anyone can scare you for a moment or two by unexpectedly hacking off a character’s limb or showering you with gore, but creating an off-kilter atmosphere that maintains the sense that, at any given moment something scary may happen takes a lot more talent. It sounds contradictory, but eerie is always more frightening than outright scary, at least for me. For those who are hoping that Perry and Dex finally get together…well, I’m not telling you if they do or don’t. Let’s just say that Halle really knows how to dish out the appetizers, but seems to take a sadistic pleasure in withholding the main course. Perry and Dex definitely make some headway though, and the island takes their relationship to a whole new level during some truly awesome scenes. They’re moving beyond the mere acquaintances with a common interest that they were in Darkhouse, and even beyond that tentative “becoming friends with a romantic undercurrent” relationship that they had in Red Fox. Halle does an excellent job of doling out just enough information about Dex and Perry in each book to keep you dying for the next book. I stayed up until 2:30 in the morning to finish Dead Sky Morning despite the fact that I could barely form coherent thoughts by that point from the mild sleep deprivation that always comes with adjusting to the “back-to-school” schedule. There is so much more I want to say about this book, but it would give away key plot points. So I’ll conclude by saying that Karina Halle’s writing simply rocks, and the Experiment in Terror series has shot its way to the very top of my “absolutely must read the minute it comes out” list.